The branch had visited the Metso Secunda valve shop on Friday 2 November. 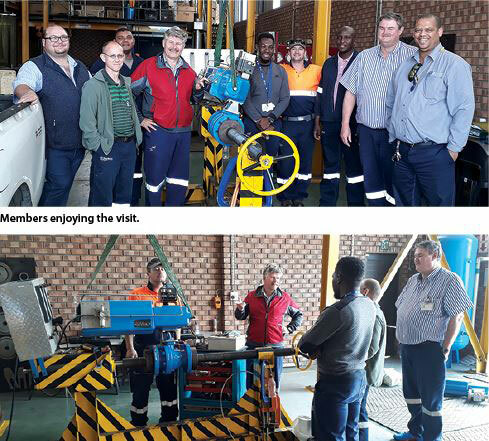 Johan van den Heever and the Metso Secunda team gave members a detailed tour of their site and the equipment they use to give their products the necessary support, mainly Metso valves, but also other valves which they are accredited to service and repair. The technical team uses equipment that caters for the products they need to certify for use on a site like Sasol Synfuels and Sasol Chemical Operations. It was interesting to witness the pressure testing of a valve that had to be released to the Sasol Secunda site. One of the rigs can test for pressure up to 110 bar. The Metso team have also made adaptions to the current system to cater for larger sizes, which would then also pass the criteria for valve pressure testing. The branch thanks the Metso Secunda team for taking the time to share their knowledge with us. All instrumentation and control mechanicians, technicians and engineers are welcome to attend our monthly technology evenings in 2019, the dates will be communicated shortly. All presentations earn CPD points for ECSA-registered persons and any enquiries can be directed to branch chairman, Johan Maritz, at johanmaritz260@gmail.com or +27 82 856 3865.